SMYRNA -- Mrs. Blanche Cox Self, 86, of 292 Little Pine Drive died Thursday, Jan. 6, 2005, at Joseph M. Still Burn Center in Augusta, Ga. The funeral will be 2:30 p.m. Sunday at The Colonial Chapel of Carothers Funeral Home in Gastonia, N.C., with the Rev. Bill Harris officiating. Burial will be at Gaston Memorial Park. A native of Buncombe County, N.C., Mrs. Self was a daughter of the late James E. Cox and Ollie Campbell Cox. She was a homemaker and was a member of Enon Baptist Church. She was the widow of Romey O. Self. Surviving are three daughters, Nettie Marie Owensby of Clover, Rose Mary Jump of Hudson, N.C., and Nancy Jo Wilson of Smyrna; two brothers, Danny Cox of Missouri and Tim Cox of Hayesville, N.C.; eight sisters, Sarah Sands of Sweetwater, Tenn., Hazel Jordan of Kentucky, Marie Lamontagne of Springfield, Mass., Beryle Petrides of Logansville, Ga., Bert Ott of Macon, Ga., Daisy Bennett of Savannah, Ga., Louise Ladd of Gastonia and Patricia Cox of Washington, D.C.; eight grandchildren; and nine great-grandchildren. The family will receive friends from 6 to 8 tonight and 2 to 2:30 p.m. Sunday at the funeral home. Memorials may be made to SouthEastern Firefighters Burn Foundation, Inc., 3614 J. Dewey Gray Circle, Building C, Augusta, GA 30909. PUBLISHER'S NOTE: Andy has not researched the Selfs & Hudsons personally, other than what he's found in the NC Archive near his Blackards. He's relied a lot on internet information, but that was necessary as he's been looking at a group of about 25 families. Because of the intertwined relationship between the Selfs and his other surnames, his work continues to be a valuable resource for quite a few Self branches. Recently I am beginning to understand some more family parallels. Some of those early Granville NC families seemed to show up in more of the same places later than I knew before. Humphries family and both the Selfs and Blackards married Hendersons. Isaac Self was the grandson of Issac Hudson who shows up in NC close to Charles Blackard I in 1755/6. Isaac Self m. Nancy Henderson [note: this is extra "ammunition" for those who believe that Nancy's maiden name was actually Henderson] about the same time that Charles Blackard m. Betty Henderson in Granville. So they were married into the family even excluding my hunch of a Self-Blackard marriage. You may remember that our Job Blackard was named after Job Self, apparently. There were also Willoughby Blackards and Willoughby Selfs. In 1790 Willoughby Blackard is in Salisbury district, Rowan County. In the adjacent county, in Salisbury District of Montgomery County NC, appear Spencer, Francis, Isaac and Presley Self who are descendents of the Bute Co NC Self family. Then Charles Blackard, Isaac Self and Job Self show up on the Wake NC tax lists around 1793-9. Also Presley Self and William Blackard are both named on a 1797 Warren(Bute) estate sale. Then some of the Selfs, the younger siblings of the Granville Henderson family and part of the Humphries family related to Elizabeth Humphries Blackard all show up in Pendleton SC around 1800. Some unidentified Blackards are also in the Pendleton records. Levi Self is there too. Some other Selfs and Humphries show up in Chester co SC. By 1805-1807 Levi Self, the Hudsons, the Humphries and two Blackard lines are all in TN. In 1810 Ownsby Self and Henry Self (thought to be nephew of Levi Self) appear near Charles Blackard in the Barren KY census. Humphries is also there. Isaac Hudson's brother Chamberlain and William Blackard die near each other in TN in 1825 and 1821.
of coincidences unless they had some connections. I feel that the Blackards had marriage ties to all 4 other families. I have no hard proof for a Self-Blackard marriage but there is a lot of circumstancial evidence and records of ties to the other families. PUBLISHER'S NOTE: Are there any Self ties to Hudson-Henderson-Humphries that you know of? If so, please let me know so we can pass them on to Andy. Yours of recent date is to hand, and I was very glad to hear from you and family all. It had been quite a long time since I had a letter from you and I was very anxious to hear from you and the family and the far off land of Texas. I am sorry that you are having such a disagreeable winter as you report. The winter hear is delightful, it is what we call up hear an open winter. It is not very cold but for the most part the weather is clear and bright. E have not had a great amount of rain or snow up to this time. The ground is frozen all the time but it is not cold enough to make much ice. Ice men are hoping for some colder weather in February then we have yet had. The ice crop in this country is a very important item indeed. The great corn crop of this country has all been gathered and it is simply immense. And when it all goes to market it will bring in an immense amount of money. There has been a great amount of pork already feted and sent to market and it has brought a pretty fine price. It has ranged all the way from four seventy five to something over five dollars per hundred pounds. Beef has been some lower then usual ranging from four to five dollars per hundred pounds. I mean gross and I mean that the pork was gross. The crop of oats was immense and they I think are worth from 25 to 30 cents per bushel. The immense hay crop I think is worth some eight dollars per ton. The wheat crop of last year was not a large crop in Illinois. I do not know what it is now selling for, but flour is from three dollars and fifty cents per hundred to five dollars. I think that the financial condition of the country is pretty good now and a good prospect for the future. I was glad to hear that Miss Corrilla was at school. Hope that she will do well and learn much. I should be glad if she could come up hear and attend Lincoln University. 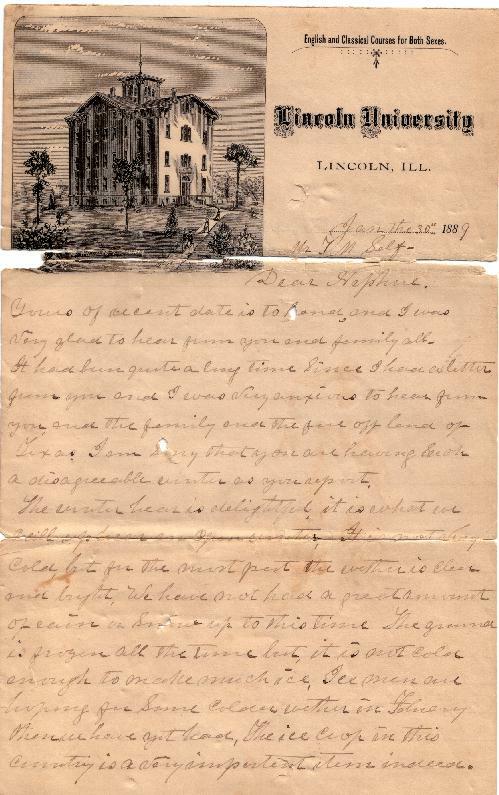 You will find a picture of the Lincoln University on the first page of this letter. The building and grounds and fixtures is worth about 80,000 dollars and we have a very fine school here all the time. We have nice departments of Language and Natural Science and Mathematics. We have a conservatory of music and a good business College. There one can learn the out of business together with shorthand, type writing and telegraphing. And we can do well for those coming hear to school. The most miserable draw back to this grand country end to our city is the fearful Saloon business. People are afraid to send their boys off the school on this account. I should be so glad to see you one time at my house. I think that we would have a good time and if you all can come I want you to come and bring any or all of your family with you. I should like if you could bring your wife and see us. I want you all to feel that you have a standing invitation to come and see us and stay as long as you can with us. I want you to fee that if I ever can I shall come and see you and stay as long as I can with you. I was well pleased with you all and have been sorry that I did not remain longer with you when I was at your house. As for the treatment, it was the kind that suited me and I am sure that it was all given with freedom and that is what makes a thing good is for it to come free. As for the things that I wanted you to get for me, I want anything that would be a curiosity and I shall pay you for your trouble. I was thinking that I should have liked very much to have sent you a piece of our Christmas beef but the weather has been two warm to make it safe to express meat so far South. One of our butchers killed a yearling steer that weighed 1380 pounds gross. This was as fine beef as I ever saw. I did wish that you had a piece but the weather was two warm to send it. I hope to see you all sometime again. I want you to give to your wife and children and to Edward and James and their families my best regards. I should like to see them all. I am sorry that your brother Frank will not write to any of us. I hope that he will do better in the future. I had my second son to visit us a few days since. He lives in Kearney. He is a merchant there. He brought his little daughter, 6 years old, with him. He spent some 10 days with us. He is highly pleased with Kearney and he says that it is booming. I think I told you of the great water power that they have there. It is sufficient to manufacture anything that it requires power to manufacture. He said that a company of men representing capital amounting to 22 millions of dollars came in there and within the last 90 days they had purchased real estate to the amount of 1,000,000.00 dollars and he says that real estate is very high and advancing all the time and he thinks that they will soon have a large city there. The name of this son is Virgil and he is now in his 31st year. He married a Miss Zimmerman of Illinois and they have 3 living children and one dead. He was glad to hear about your family for I told him of my trip to your house. I had a letter this week from my son-in-law. He lives at Pontiac in this State but he was in Colorado when he wrote on business. I also had a letter from my daughter this week from Pontiac. She has not been well this winter, has been afflicted with cold. She has two children, a girl about 5 years old and one boy 3 years old. They have a good home in the city of Pontiac. I had a letter today from my son at Lindell, Kansas. That is from the youngest. My oldest boy lives there. My youngest boy is named John. Married in the city of Chicago. They have two children, a boy and girl. He is in the real estate and mercantile business. He also is connected with a manufacturing business and I suppose that he has and is still making money. He has two children, a boy and a girl. They were all excited about coming to see us this Spring. He stated that my oldest boy Robert who edits a paper in Indell was well and doing well. Robert, my oldest boy is now in his 33rd year of his age. A large and fine looking man but never was married. He is sure an old bachelor. I suppose that I have sure enough a beautiful family. I think if I live I shall go out to Kearney the latter part of next June. I wish you were hear to go with me. You could see the finest country and the most beautiful colies that you ever say in your life. I want you to tell you daughter that I have not forgotten that I promised to send her my picture and some other things. Tell her that I will send them when I can. The winter season is always the busy time for me. I will have more time when winter is over. Give my love to all the family. Jane and Mary send their love to all the family and to Edward and James. Were you excited when you met your first close relative online at a genealogy site or message board? Then imagine how it felt for Yvonne Luchetti and Margaret Curren of Tarrawanna, Wollongong, Australia when they unexpectedly heard from their half-brothers in Queensland--especially since they had no idea that they even existed! In 2002, we were contacted by Ken Self who was researching his Self roots in Australia and England. Three years later, Kay Strang--also of Australia--wrote to us, and we introduced her to Ken. It's by way of Kay, with Ken's permission, that this story is told. Keith Self, Ken's brother, sent for his birth certificate in 1962 and learned from it that his father had been married before and had had two children, both girls, from that union. His parents refused to talk about the marriage or the boys' half-siblings. Keith and Ken, however, were determined to find their half-sisters when they began compiling their family history. There were two more Self brothers also. Norm had died young in the service of his country. Byran, who was also interested in his sisters, had to care for his sick wife and therefore had limited participation in the reunion. Keith Self and Yvonne Luchetti were the first pair of siblings to meet over the telephone. Yvonne hadn't known any more about her half-brothers than they had known about her. Ken Self called Margaret Curren who was also surprised. "Surprised" is probably a very mild word for what the sisters felt. "Shock" seems more appropriate--but having been there mySelf, I know that sometimes the only way to establish a connection is simply to write or call and say, "Guess what?" This tale has a very happy ending. Ken and Keith Self undertook a long journey to visit their sisters for the first time. They had so much to catch up on. There were family stories and photos and memories of childhoods that they finally shared after so many years apart. This is one huge example of a successful research project. Let's hope that the brothers and sisters can now find the ancestors that bind them together. My Uncle tells a story about his recently deceased brother John C. Kenney, whose grandmother was Fannie Griffith Self. His given name at birth was Johncalvaine. Later in his life, when he went to work for the Federal Bureau of Investigation, he was required to put a middle name in his file because according to Mr. J. Edgar Hoover, everyone has a middle name. From that day on , my Uncle Jack was officially known as John Calvaine Kenney.